This article is about the Massachusetts river. For other uses, see Charles River (disambiguation). The Charles River (sometimes called the River Charles or simply the Charles) is an 80-mile-long (129 km) long river in eastern Massachusetts. From its source in Hopkinton the river flows in a northeasterly direction (after first coursing due south through Milford), traveling through 23 cities and towns before reaching the Atlantic Ocean at Boston. The Native-American name for the Charles River was Quinobequin, meaning "meandering". 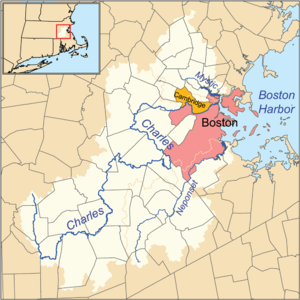 The Charles River is fed by approximately 80 streams and several major aquifers as it flows 80 miles (129 km), starting at Teresa Road just north of Echo Lake (42°12′54″N 71°30′52″W﻿ / ﻿42.215°N 71.514444°W﻿ / 42.215; -71.514444) in Hopkinton, passing through 23 cities and towns in eastern Massachusetts before emptying into Boston Harbor. Thirty-three lakes and ponds and 35 municipalities are entirely or partially part of the Charles River drainage basin. Despite the river's length and relatively large drainage area (308 square miles, 798 km2), its source is only 26 miles (42 km) from its mouth, and the river drops only 350 feet (107 m) from source to sea. The Charles River watershed contains more than 8,000 acres (32 km2) of protected wetlands, referred to as Natural Valley Storage. These areas are important in preventing downstream flooding and providing natural habitats to native species. Harvard University, Boston University, and the Massachusetts Institute of Technology are located along the Charles River. Near its mouth, it forms the border between downtown Boston and Cambridge and Charlestown. 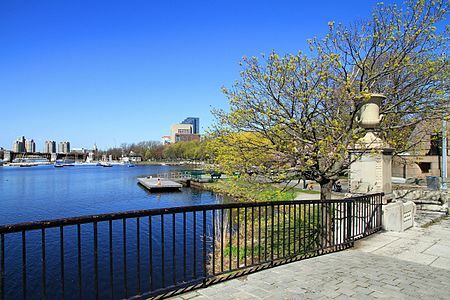 The river opens into a broad basin and is lined by the parks of the Charles River Reservation. On the Charles River Esplanade stands the Hatch Shell, where concerts are given in summer evenings. The basin is especially known for its Independence Day celebration. 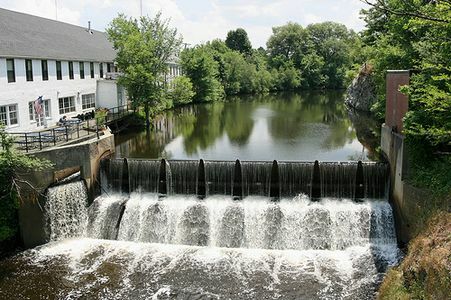 The middle section of the river between the Watertown Dam and Wellesley is partially protected by the properties of the Upper Charles River Reservation and other state parks, including the Hemlock Gorge Reservation, Cutler Park, and the Elm Bank Reservation. A detailed depth chart of the lower basin of the Charles River, from near the Watertown Dam to the New Charles River Dam, has been created by a partnership between the MIT Sea Grant College Program and the Charles River Alliance of Boaters (CRAB). Online and hardcopy charts are available as a public service. The river is well known for its rowing, sculling, canoeing, kayaking, paddleboarding, dragonboating, and sailing, both recreational and competitive. The river may also be kayaked; depending on the season, however, kayakers can only navigate the Charles by getting out and dragging their kayaks for significant stretches. The "Lower Basin" between the Longfellow and Harvard bridges is home to Community Boating, the Harvard University Sailing Center, and the MIT Sailing Pavilion. The Head of the Charles Regatta is held here every October. In early June, the annual Hong Kong Boston Dragon boat Festival is held in Cambridge, near the Weeks Footbridge. For several years, the Charles River Speedway operated along part of the river. Long before European settlers named and shaped the Charles, Native Americans living in New England made the river a central part of their lives. The native name[clarification needed] for the Charles River was Quinobequin, meaning "meandering". Captain John Smith explored and mapped the coast of New England, naming many features, originally naming the Charles River the Massachusetts River, which was derived from the tribe living in the region. When Smith presented his map to King Charles I he suggested that the king should feel free to change any of the "barbarous names" for "English" ones. The King made many such changes, but only four survive today, one of which is the Charles River which Charles named for himself. In portions of its length, the Charles drops slowly in elevation and has relatively little current. Despite this, early settlers in Dedham, Massachusetts, found a way to use the Charles to power mills. In 1639, the town dug a canal from the Charles to a nearby brook that drained to the Neponset River. By this action, a portion of the Charles's flow was diverted, providing enough current for several mills. The new canal and the brook together are now called Mother Brook. The canal is regarded as the first industrial canal in North America. It remains in use for flood control. Waltham was the site of the first fully integrated textile factory in America, built by Francis Cabot Lowell in 1814, and by the 19th century the Charles River was one of the most industrialized areas in the United States. Its hydropower soon fueled many mills and factories. By the century's end, 20 dams had been built across the river, mostly to generate power for industry. An 1875 government report listed 43 mills along the 9 1⁄2-mile (15 km) tidal estuary from Watertown Dam to Boston Harbor. Eliot first envisioned today's river design in the 1890s, an important model being the layout of the Alster basin in Hamburg, but major construction began only after Eliot's death with the damming of the river's mouth at today's Boston Museum of Science, an effort led by James Jackson Storrow. The new dam, completed in 1910, stabilized the water level from Boston to Watertown, eliminating the existing mud flats, and a narrow embankment was built between Leverett Circle and Charlesgate. After Storrow's death, his widow Mrs. James Jackson Storrow donated $1 million toward the creation of a more generously landscaped park along the Esplanade; it was dedicated in 1936 as the Storrow Memorial Embankment. This also enabled the construction of many public docks in the Charles River Basin. In the 1950s a highway, Storrow Drive, was built along the edge of the Esplanade to connect Charles Circle with Soldiers Field Road, and the Esplanade was enlarged on the water side of the new highway. As sewage, industrial wastewater and urban runoff flowed freely into the river from the surrounding city, the Charles River became well known for its high level of pollutants, gaining such notoriety that by 1955, Bernard DeVoto wrote in Harper's Magazine that the Charles was "foul and noisome, polluted by offal and industrious wastes, scummy with oil, unlikely to be mistaken for water." Fish kills and submerged vehicles were a common sight, along with toxic chemical plumes that colored parts of the river pink and orange. The Standells sang about the sorry state of the Charles in their 1965 song "Dirty Water". Once popular with swimmers, awareness of the river's high pollution levels forced the state to shut down several popular swimming areas, including Cambridge's Magazine Beach and Gerry Landing public beaches. A combination of public and private initiatives helped drastically lower levels of pollutants by focusing on eliminating combined sewer overflows and stormwater runoff. Since Weld's stunt, the river's condition has improved dramatically, although it was not deemed entirely swimmable by 2005. The water quality of the Charles River is often at its worst after a large rainfall because of pollutants carried by runoff, and sewage overflows. For 2011, the EPA reported that the Charles met state bacterial standards for boating and swimming 96% and 89% of the time on dry days, and 74% and 35% of the time on wet days, respectively. Overall boatability and swimability of 82% and 54% in 2011 compare with 39% and 19% in 1995. In June 2018, the Environmental Protection Agency graded the river's 2017 bacterial water quality "A−". As of 2013, boating is allowed on the Charles but swimming without a permit is punishable by a fine up to $250. 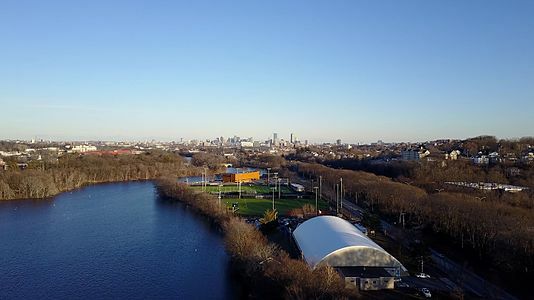 Starting in 2007, the Charles River Swimming Club has organized an annual race for its members, but obtains a special permit and must monitor water quality and rainfall in the days leading up to the race. The "first public swim" in the Charles since the 1950s was conducted on July 13, 2013, by the Charles River Conservancy[Note 1], Charles River Watershed Association (CRWA), Esplanade Association, and DCR. Both the annual race and the Conservancy event have been held in deep water with swimmers jumping in off a dock, to avoid the toxic sediments on the bottom of the river that still make beach swimming dangerous. View of the Charles River, Community Rowing, Inc. and Boston from Nonantum. 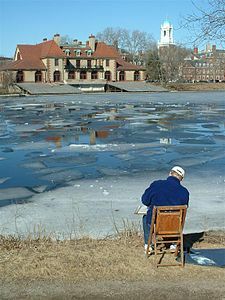 ^ The Charles River Conservancy was founded by Renata von Tscharner. ^ a b "Charles River Watershed". The Charles River Watershed Association. Retrieved February 5, 2013. ^ "CRAB and MIT Sea Grant Chart of the Lower Charles River". MIT Sea Grant College Program. Retrieved March 15, 2019. ^ "Charles River Mileage Map/Table". Web.mit.edu. Retrieved 2012-04-16. ^ Brody, Sharon (2013-07-13). "Public Swim Follows 50 Years Of Dirty Water". WBUR. Retrieved 2013-07-18. ^ "Who Made America? Pioneers: Francis Cabot Lowell". PBS. Retrieved July 30, 2011. ^ Karl Haglund (2003). Inventing the Charles River. Cambridge, Massachusetts: The MIT Press. ISBN 0-262-08307-8. ^ "Group Eyes Lawsuit Over Charles River Pollution". Boston.com. Retrieved 16 October 2014. ^ "Clear and Clean". Boston.com. Retrieved 16 October 2014. ^ "Charles River Watershed Association". Crwa.org. Retrieved 16 October 2014. ^ "Online NewsHour: KERRY / WELD: DEAD HEAT". PBS NewsHour. Retrieved 16 October 2014. ^ "Person of the Week: Christopher Swain". ABC News. Retrieved 16 October 2014. ^ "Vermont swimmer hates dirty water, but covers entire Charles River in Mass. : Times Argus Online". Timesargus.com. Archived from the original on 21 October 2014. Retrieved 16 October 2014. ^ Mark Clayton (8 November 2004). "An 80-mile swim - with hubcaps". The Christian Science Monitor. Retrieved 16 October 2014. ^ "Conservation Law Foundation Secures Groundbreaking Outcome in GenOn Kendall Plant Case - Innovative Solution to Cooling System Issues Will Improve Charles River Health, Bring Lower Carbon Steam Heat and Power to City Buildings". Conservation Law Foundation. 2011-02-02. Retrieved 2015-04-06. ^ "Report Cards - Charles River - New England - US EPA". Epa.gov. Retrieved 16 October 2014. ^ Hellweger, F. L.; Masopust, P. (2008). "Investigating the Fate and Transport of Escherichia coli in the Charles River, Boston, Using High‐Resolution Observation and Modeling". JAWRA Journal of the American Water Resources Association. 44 (2): 509–522. doi:10.1111/j.1752-1688.2008.00179.x. ^ "Researcher Develops Model to Track E. coli in Charles River". Newswise.com. Retrieved 16 October 2014. ^ Beard, David (October 26, 2008). "Oysters help clean the Charles River". The Boston Globe. ^ Swimming and ice skating are prohibited by 350 CMR 12.02 (7) except where posted by the Department of Conservation and Recreation, and as of 2013 there are no posted swimming areas. The maximum fine is set by 350 CMR 12.03. ^ Belluck, Pam (July 22, 2007). "A Boston River Now (Mostly) Fit for Swimming". The New York Times. 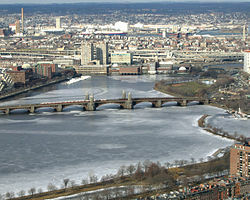 ^ "Charles River opens for first public swim since the 1950s". The Boston Globe. ^ "Charles River Swimming Club, Inc. : Maps". Charlesriverswimmingclub.org. Retrieved 16 October 2014. ^ "Public Swim Follows 50 Years Of Dirty Water". WBUR. 13 July 2013. Retrieved 16 October 2014. Tourtellot, Arthur Bernon (2014) . Benet, Stephen Vincent; Carmer, Carl (eds.). The Charles. Rivers of America. Mineola, N.Y.: Dover Publications. ISBN 9780486492940. OCLC 990111. "Charles River" . New International Encyclopedia. 1905.